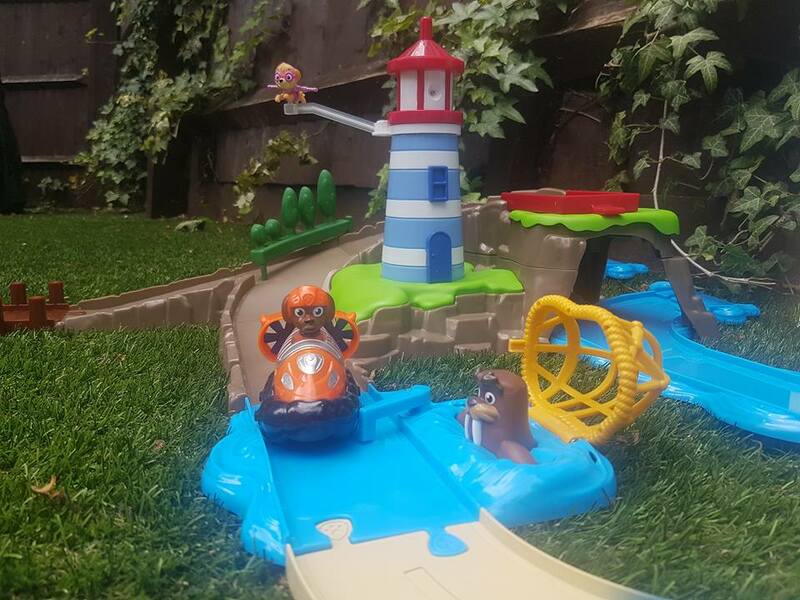 This set features two of Rocky's favourite characters Skye and Zuma and includes his favourite area, the lighthouse; which even lights up and makes Skye fly. Being a little water baby, having the blue water track pieces has meant he can recreate his own fun at the seaside with his four legged TV friend's, making them swim out to sea and paddle on the shore. When asked what his favourite part of the set was he said that it was the fact he could save Wally the Walrus from the trap, just like they do on the tele or he can move the trees out of the way and zoom into the water via the dock. The fact he has options made this very soon to be 5yr old very happy. He had a friend round to play after school and it was the first thing he showed him. They both gave the Skye & Zuma Lighthouse Rescue Track Set 5 stars... praise indeed. Spinmaster have created a number of interactive and interconnectable Paw Patrol Track Sets so that your little Paw Patrol lovers can create their very own Adventure Bay. The robust and bright plastic sets come in separate parts which can be mixed and matched to create different scenes from their favourite episodes, whilst letting their imagination run wild creating their own stories too. They work perfectly with the Paw Patrol Racers (the individual characters with their vehicle's) which the named pups on the box are included in the sets, although the other Paw Patrol characters are available separately too. All in all this set is going to be a hit for a long time here in Castle Hassall and we would recommend it for any Paw Patrol fan for birthday's and Christmas gifts. You could even get different members of the family to buy different sets so they can create their very own Adventure bay that bit quicker (saving you buying them all too; I know, I'm a genius).